This photo is of Hedda at a water park. She loves this place! She usually runs to the water area first and takes a little swim. Then she does a bunch of loops and turns, it's just beautiful to watch her move! Then she wants to play in the water. She will fetch over and over again just having a blast. She's having so much fun we lose track of time and end up staying longer than we planned but it is worth it to see Hedda so happy! This is our 9 month old Blue Merle Australian Shepherd Kylie. 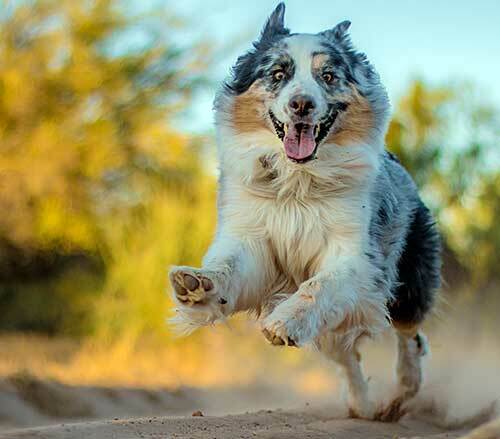 Kylie is your typical Aussie; full of life and very active. She loves playing outside and snow doesn't phase her in the least. Moving to the coast of Maine and experiencing record snow fall and cold temperatures hasn't impacted her ability to have fun outside! 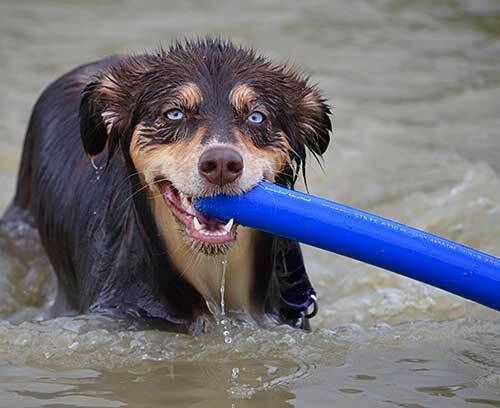 Maverick Rodriguez Brumm is a male, 3.5 year old, black-tri aussie from New England. He is also a Navy brat. He has been stationed with his family in CT (where he was born) and California (where we are now) and we are about to move to the dog friendly city of Paris, France! Don't know if it's a chicken or egg thing, but Maverick lives up to his name. He loves to show off how fast he is, and he loves to do "fly-by's" where he runs at you as fast as he can, then at the very last second, right before you think he is about to slam into you, he falls off to the right, so close that you can feel his fur on your leg. Maverick sports a military style buzz haircut because we go to the beach at least 5 days a week, and his coat can hold POUNDS of sand in it, especially after he dives into the waves then rocks a few sand-angels to dry off. He is super accomplished, already having completed agility classes, a half marathon and even a Spartan Beast (carrying only his own water of course :) He is very well traveled having made a cross country trip, many trips up and down the eastern seaboard and all over central and nor Cal. He loves the car, hide and seek, soccer and football. And in the evenings, he enjoys watching House and Walking Dead. 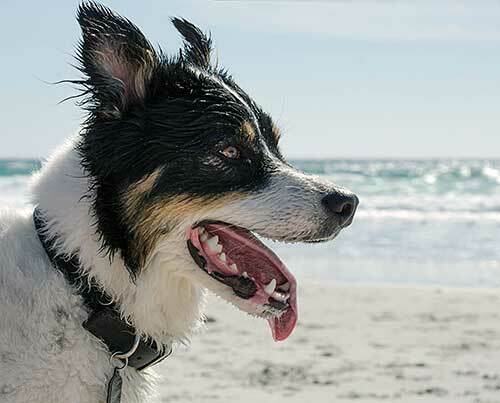 This picture was taken at Carmel Beach, an awesome off-leash beach where he gets to run around free, play in the waves and race other dogs. 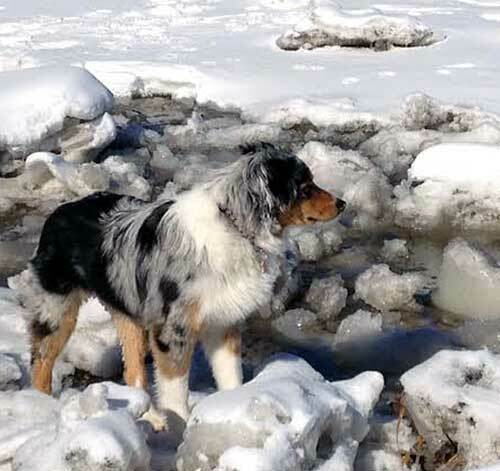 This is our 3 year-old blue merle Australian Shepherd, Jasper. He's a very happy dog. And he should be. We shower him with love, play with him constantly and take him on wonderful adventures in the Arizona wilderness. This was taken just outside of Phoenix, AZ where we hike frequently and where Jasper loves to hunt lizards (but he's never actually caught one). 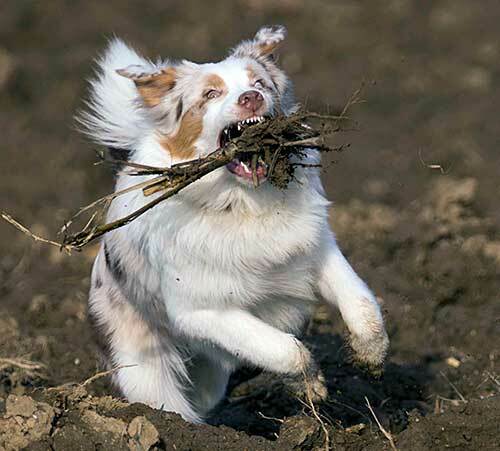 Finding just the right stick or just for the pure joy of it all, Jasper often gets the "zoomies" in this area, running at full speed in one direction, doing some back-and-forth maneuvers, then dashing the other direction, challenging his humans to do the same. Love this boy. My dog Sunny from Bad Nauheim, Germany, is a 10 month old female who loves to grab whatever she can get her mouth on and turn on her afterburners to get away. 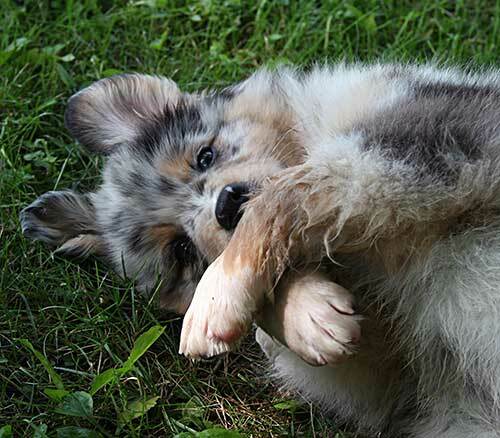 Lyric is our first Aussie, born May 20, 2014 and is raw fed and naturally reared. Here she is at 8 weeks, the day we brought her home—she was obviously a well adjusted pup! She belongs to me, my kids Drake, 11 and Rhedyn, 7 and our Siberian Indian Dog, Rogan. We live in the woods off a 1,800 foot drive way off a dead end dirt road. We do agility together and romp and play in the woods with the kids. She welcomes new experiences with gusto and is a very versatile pup. Lyric is our first Aussie of many more I can be sure of that. I fell in love with her breeder and her mother and was so fortunate to bring her home to join our family. She is a perfect fit!